Based on the play by Bertolt Brecht, Baal is the story of a poet who commits a murder and engage in various sexual affairs with different women including one he would abandon. Directed by Alan Clarke and teleplay by John Willett, the experimental TV production is a theatrical take on the story that features David Bowie playing the titular character. Also starring Tracey Childs, Zoe Wanamaker, Juliet Hammond, and Jonathan Kent. Baal is an eerie yet unsettling TV film from Alan Clarke. Set in the early 20th Century in Germany before the First World War, the film revolves around a poet who travels around Germany to scrounge up anything he can get in an act of defiance towards bourgeoisie society. Through his misadventures, Baal would engage in many affairs with different women whom he would treat with indifference while doing what he can to survive without the conventions of society despite his popularity with the ordinary people for his poets and songs. The film’s teleplay by Alan Clarke is mainly a character study of this man who is an artist that creates great poets, songs, and drawings yet he does it for money that he often spends on women and booze. During this time, he would gain different lovers while trying to deal with the changes in society to a world that he feels like he has no part of forcing him to survive on his own terms. Clarke’s direction does have elements of style in its framing as well as the small interludes in between chapters that has Baal singing at the edge of a frame with the other half of the frame focusing on what is to happen next or a landscape. Shot on soundstages in London, Clarke doesn’t aim for a lot of big camera movements but rather maintain something theatrical by shooting scenes mainly on wide or in medium shots as there aren’t many close-ups in the film. Still, Clarke maintains this air of drama into the situations that Baal is in as he’s with different lovers or singing about those he loved and left behind while defying the many ideas of bourgeoisie society who wants to use him for their own reasons. The framing device and compositions are abstract in the presentation whenever Baal sings during an interlude as it would include these eerie moments of cruelty that Baal would lay upon someone whether it’s a lover or close friends. Overall, Clarke crafts a dark yet riveting film about a poet’s journey of decadence and defiance in early 20th Century Germany. Cinematographer John Timbers does excellent work with the cinematography as it has a crudeness to its look as it was shot on video while does use some nice lighting to help maintain an atmosphere for the scene. Editor Howard Dell does terrific work with the editing as it is largely straightforward with a dissolve in one shot in the film as it play into the drama. Production designer Tony Abbott and art director Andrew Christian do brilliant work with the look of the sets from the pubs and places that Baal goes as well as the garage that he lives in. Costume designer Reg Samuel does fantastic work with the costumes from the ragged look of Baal as well as the cleaner look of the other characters. Makeup artist Pauline Cox does amazing work with the look of Baal in his ragged look as well as the fact that he doesn’t have many teeth. Visual effects by Dave Jervis does nice work with the film’s minimal visual effects for some of the video look and the backdrops that are used in a few scenes. The sound work of John Howell and Mike Jones is superb for the sparse sounds used in the film as it help maintain that air of theatricality that is prevalent in the film. The film’s music soundtrack that is based on the arrangements by Dominic Muldowney is mainly folk-based with Bowie singing and playing a banjo with many of the lyrics by Bertolt Brecht that play into the misadventures and conquests of Baal as it’s one of the film’s highlights. The film’s wonderful ensemble cast include a few notable small roles from Julian Wadham as a rich patron in Johannes Schmidt, Robert Austin as the publisher Mech, Juliet Hammond as Mech’s wife Emelie whom Baal would sleep with, Polly James as a pub singer, James Duggan and Bill Stewart as a couple of policeman, and Brian Coburn as a woodcutter watching over the ailing Baal. Tracey Childs and Zoe Wanamaker are fantastic in their respective roles as a couple of Baal’s lovers in Johanna and Sophie as two women who would embark on affairs with him as the former succumbs to tragedy while the latter is abandoned once she becomes pregnant. Jonathan Kent is excellent as Baal’s friend Ekart as a fellow traveler who often speaks fondly of Baal yet would become frustrated by Baal’s antics as the years go by. Finally, there’s David Bowie in an incredible performance as the titular character as it shows Bowie displaying some charm into a character that is detestable and cruel where Bowie isn’t afraid to play dirty while showcasing elements of a man who defies convention yet doesn’t care who he hurts as it’s one of his finest roles. 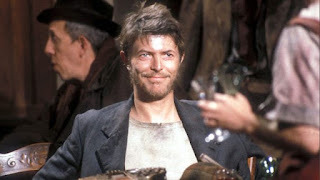 Baal is a marvelous TV film from Alan Clarke that features a great performance from David Bowie. It’s an abstract yet engaging TV film from the BBC that uses Bertolt Brecht’s story of a man who defies the idea of convention and society yet would take part in decadence as a way to rebel while also displaying cruelty to those who become close to him. In the end, Baal is a remarkable film from Alan Clarke.